Is a 3-day cruise enough to discover the Greek Islands? There’s something about the Aegean that gets me every time. Landing in Athens as the sun sets golden over the city, then setting off the next day from the busy port of Piraeus through sparkling, aquamarine sea, always fills me with excitement and wonder, whether I’m on a workaday ferry or – as this time – on the cruise ship Celestyal Olympia, heading for a quickie three-day tour embracing four classic Greek islands and Turkey. Celestyal is a brand of Cypriot line Louis Cruises, and the Hellenic Mediterranean is their backyard. 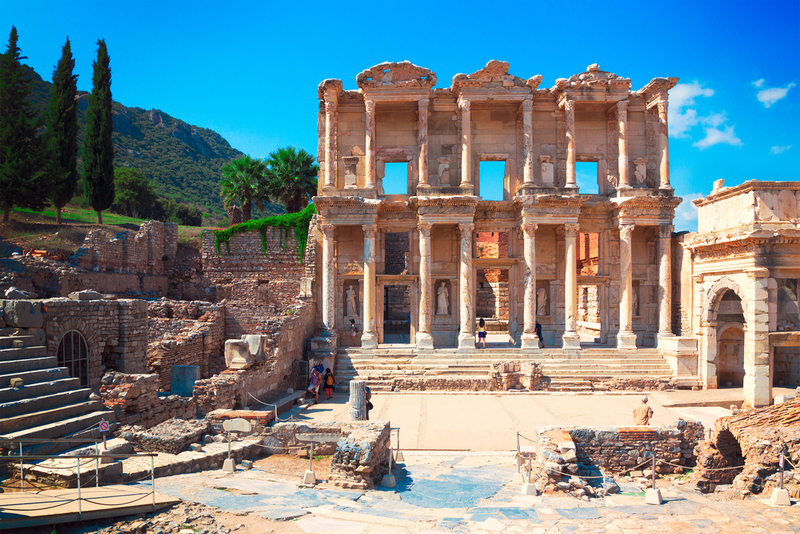 These cruises are introductions to Ancient Greece – not forgetting Ephesus, half an hour from the port of Kusadasi in Turkey – and are affordable, educational trips for all the family or for those travelling alone. 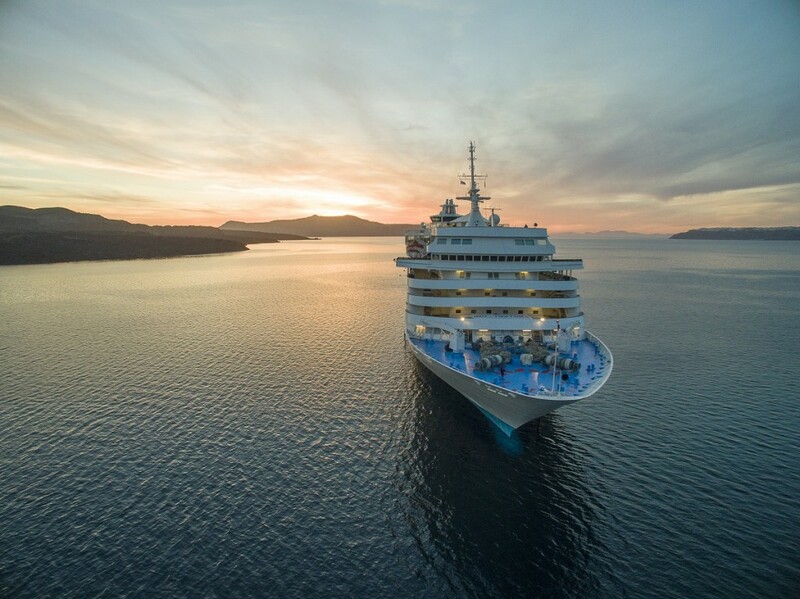 This isn’t a top-end, luxury holiday – my cabin was small, the single bunks child-sized, and the bathroom tiny – but everything worked and was clean as a pin, and the staff could not have been kinder or more eager to help. The Greek theme continues throughout your stay, from delicious Greek food, including regional dishes, and top Greek wines (the days of piney Retsina are long gone). Even the entertainment is Greek­-themed, performed by local actors. Our first port of call was beautiful Mykonos, which used to be quiet and sophisticated but these days is one of Europe’s beach-party hotspots, known as the Greek St Tropez. 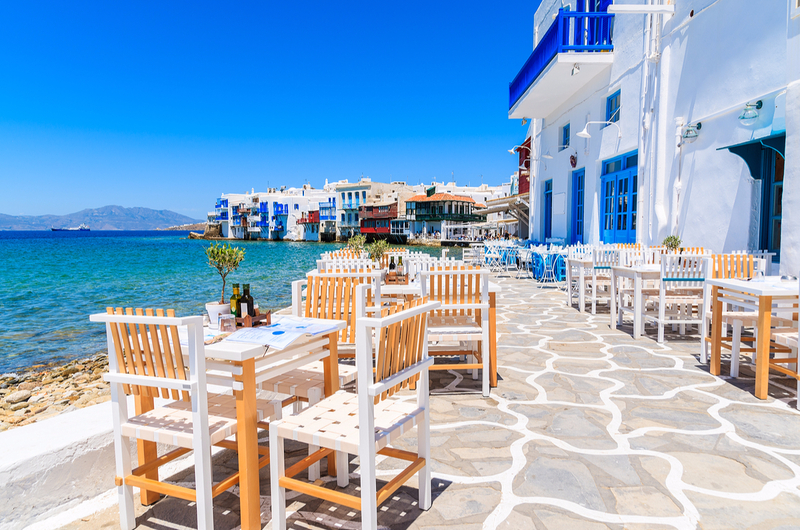 There’s a lot to see in Mykonos Chora, the port town and capital. Photographers will head for the island’s famously picturesque row of windmills – I defy you not to take at least 20 shots – while shoppers will enjoy losing themselves in the twisty streets of Little Venice and the ancient, evocative Captain’s Houses that hang over the water and now contain chic shops and bars. You’ll be impressed by the care taken to keep the town in order: neon signs are banned, every street is swept daily, doors and windows are painted in shades ranging from the famed cobalt of the church domes to sea greens and chalky blues, and the whitewash on the houses is blinding. An overnight voyage brought us to Kusadasi – not my favourite place, thanks to the hassle from over-enthusiastic traders, but we were whisked straight to Ephesus, about 20 minutes away. I’m not always a fan of ruins but Ephesus is like Pompeii – a place that just grabs you, even if you daydreamed through history lessons at school. Our guide did a brilliant job, conjuring up an image of the mighty city this once was, and showing us round what is now one of the largest open-air archaeological museums in the world. Photo-opportunitites abound here. You can pose on the Marble Road – the Street of the Kouretes, named after the legendary people from Greek mythology – with the iconic Library of Celsus behind you. You can climb to the top of the amphitheatre and – once you’ve got your breath back – shout at the top of your voice. Built in the fourth century BC to accommodate 24,000 spectators, its acoustics mean your friends will be able to hear you way down at the bottom (and speaking of which, you can have your photo taken sitting on the heart­shaped holes of the communal loos). Other additions to this half-day tour include the House of the Virgin Mary, where Our Lady is supposed to have lived until the 101st year of her life. Then it’s a short coach ride back to the covered bazaar at Kusadasi to bargain for carpets, jewellery and Turkish delight. There’s no time to waste on this three­day cruise, and after an hour we were back on the Celestyal Olympia, heading for the holy island of Patmos in the Dodecanese. We docked at Skala soon after 4pm, just as the heat of the day was receding. 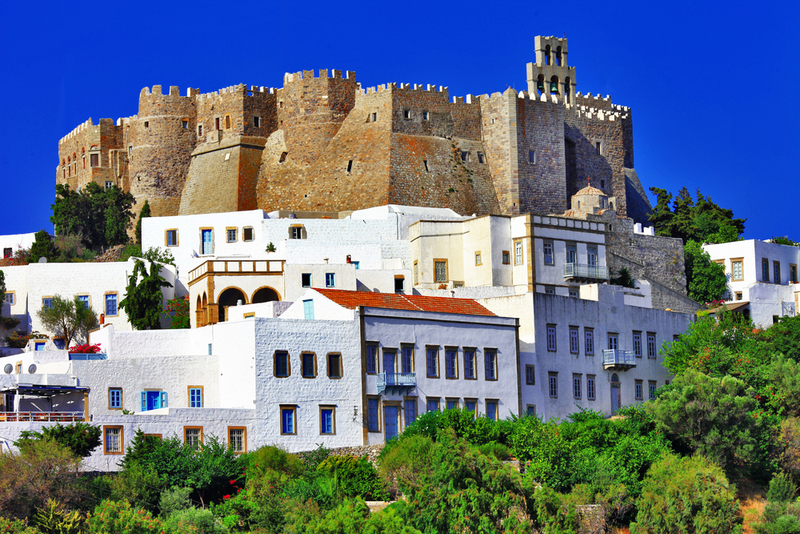 Closer to the Turkish coast than Greece, Patmos is best known as a Christian pilgrimage site. Many believe that John the Apostle wrote the Book of Revelation here, in a mountainside grotto – now called The Cave of the Apocalypse – where he heard the voice of God. Further up the mountain, within the white walls of Chora, the monastery founded in his honour in 1088 stands sentinel above this rocky but tranquil island. Both are now UNESCO World Heritage Sites. The monastery’s three windmills, dating back to 1588, were abandoned when production ceased, and fell into decay but have since been restored (cue another great photo opportunity). Skala itself is a peaceful place for a stroll and a cocktail. Pop into Cafe Arion, the oldest and most picturesque cafe in the area, for an iced coffee and a spot of people-watching. Chora is less than three miles away, up a winding road, so it’s possible to fit in both as long as you don’t hang around. This is not a cruise for those who enjoy a lie-in – but you need to arrive at ancient sites early to beat the heat and the crowds arriving on packed tour buses. Next day we docked at dawn in Crete, at the ancient Venetian port of Heraklion. The attraction here is the ruins of Knossos, about half an hour away by coach. One of the most important archaeological sites in the world, dating back 4,000 years, this ancient city is the birthplace of Europe’s first civilisation. The Palace of Knossos, was, according to tradition, the residence of the wise King Minos, and you will see the awe-inspiring Throne Room, the fresco of the Prince of the Lilies, and the imposing Grand Staircase. Even at 8am, however, Knossos was fiendishly hot and I found the stories of sacrificed bulls and masterful Minotaurs hard to absorb under the sweltering sun. Greek tour guides should learn to tailor their tales to the attention-spans of overheated north Europeans. Heraklion itself has some great shops but unfortunately on a Sunday morning they were all closed and the place was almost silent in the sunshine. A stray dog in the famous Lion’s Square was too sleepy to eat my proffered croissant, and sloped off to drink out of the Morosini fountain, an ornate Venetian creation featuring four lions with water gushing from their mouths. Back on the boat, we were soon heading to our final stop. 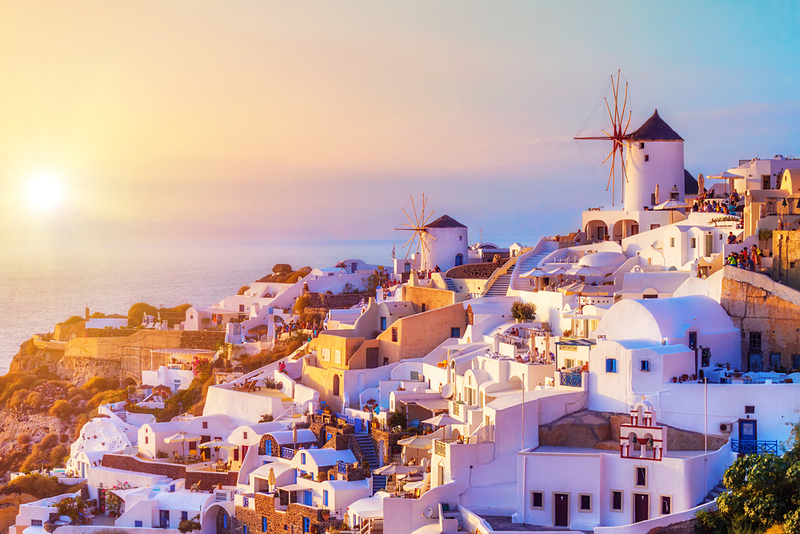 The magical island of Santorini rises high into an azure sky from the blue waters of the Aegean, the whitewashed capital of Fira like a snowy mountain-top. Grapes grow here, and a visit to a local winery such as Venetsanos is a must. Dug deep into the hillside and offering incredible views, this offers cool refuge from the Mediterranean sun (and the canny owner knew what he was doing when he ran a pipeline down to the port of Athinios to convey his produce directly into the holds of ships). Sadly, there was only time for a quick walk through the narrow streets of Fira before a stomach­-somersaulting zip down to the port below via cable car. A whistlestop tour of such stunning places can be frustrating – I wanted to linger in every port, exploring enticing alleys and dark doorways. But Celestyal Cruises has that covered too. You can embark and disembark where you like, stopping off at favourite haunts and staying a few days, then picking up the boat on its way back. But the major selling-point must be the affordability of these cruises. From just £238pp full board (drinks and shore excursions extra) the value they offer is simply outstanding.